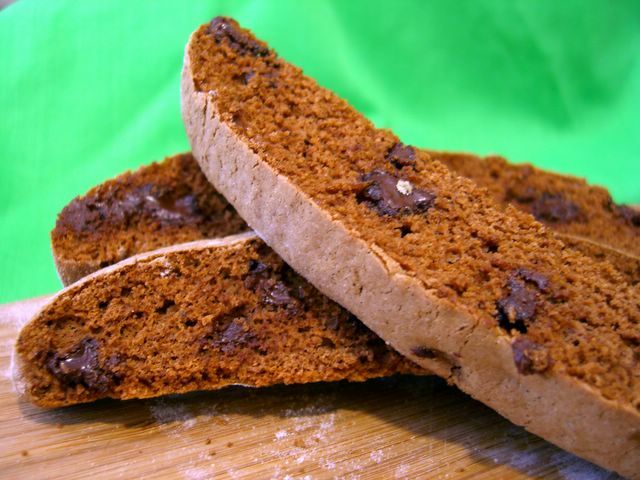 Biscotti are great. They go equally well with breakfast and dessert – my two favorite meals. Is it any wonder that I like them? In this variation of a fairly standard biscotti recipe, I added nutella, homemade by Jessica of Su Good Eats. Words can not express how good this nutella was. Though she sent it to me some time ago, I set some aside with the intention of making biscotti with it. The rest I ate on toast. And with a spoon. You see, I sent Jessica some of my homemade marshmallows – chocolate peanut-butter flavored ones, at that – because we decided to have a little blogger food exchange. It was a lot of fun to exchange goodies with someone I only really know through blogging, not to mention that I got some good feedback on my goodies and was able to try one of her favorites, as well. Would anyone else be interested in doing a food-blogger goodie exchange? We could send small packages of shippable homemade treats or a local favorite food item. I’d be happy to host and arrange the event in the next month or so, so leave feedback in my comments with suggestions and perhaps we'll get something started! Back to the biscotti, though. The final cookie is crisp and quite a bit tenderer than you might expect. It has a lovely, nutty aroma to compliment the chocolate flavors. I have, in the past, made a very similar version with peanut butter. They were very good – particularly when dipped in chocolate – but I must say that I prefer these slightly. Divide dough into 2 or 3 logs with well floured hands and arrange on a parchment lined baking sheet. Press logs into rectangles roughly ½ inch thick.